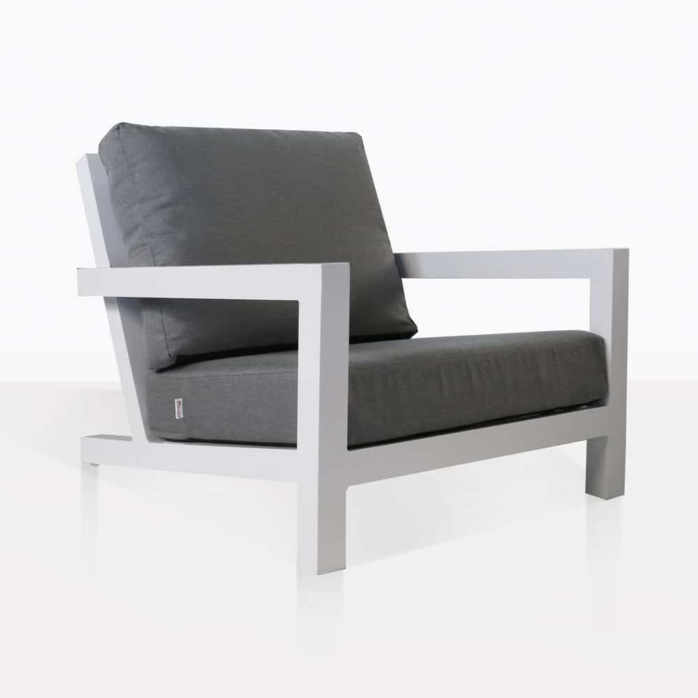 Situate yourself in a seat that defines modern luxury with the superb, urban, sleek stylings of the Granada Outdoor Club Chair. From a collection that is contemporary, slick, incredibly comfortable and the perfect blend of traditional values with modern leanings, the Granada Collection is perfect for lounging in the garden, casual dining on the verandah, and hosting friends. In the 3 core pieces, including this Club Chair, a Sofa and the Coffee Table, the Granada Collection echoes the style of the classic Adirondack Chairs, with a tilted back, strong lines, and ergonomically pleasing design. The difference is in the clean, slick package reconfigured with state of the art materials. Aluminium powder coated in white or coal (shown here in white) with soft, delightful Sunbrella® cushions in soft grey… its outdoor furniture made in heaven! Place your Granada Club Chair on a balcony or front porch for the perfect reading spot to take in the world in superior comfort. If you love the look and have the space, incorporate the Granada Collection into your garden, courtyard or on the deck! A Granada Sofa with the Coffee Table in front, and flanked by two of these amazing Club Chairs. You’ll adore the cohesive and glorious setting that Granada creates. Add in other elements to complete your open-air living area! A matching white cantilever umbrella, some concrete pots and some extra throw cushions will transport your space into something a little more special and unique. The materials in this incredible collection are of the highest quality. Strong powder coated aluminium, marine grade fixings, soft Sunbrella® fabric all deters the harsh elements and, with minimal care, keeps your furniture looking incredible for years and years to come. Cushions included as shown! Call Design Warehouse today to get your hands on this unique and stylish Granada Club Chair. You’ll adore the extraordinary design, premium comfort and excellent materials. Get Granada today!